Software giant Siemens has donated $450 million worth of advanced industrial software to the University of South Australia (UniSA) to help train students for work in cutting-edge advanced manufacturing across the naval shipbuilding sector. The $450 million grant to UniSA, the largest grant from Siemens in Australia, will see the software giant share its industrial Product Lifecycle Management (PLM) software systems with the university, ensuring students have access to advanced software, processes and best practices that are used to develop some of the most sophisticated global products and systems in industries including automotive, aerospace, shipbuilding and high-tech electronics. The suite includes tools such as the Teamcenter portfolio for engineering collaboration, NX software for 3D design, the Simcenter portfolio for predictive engineering simulation and analytics, and the Tecnomatix portfolio, which includes digital avatars. Siemens Australia chairman and CEO Jeff Connolly made the announcement at the UniSA’s Museum of Discovery (MOD) in Adelaide. 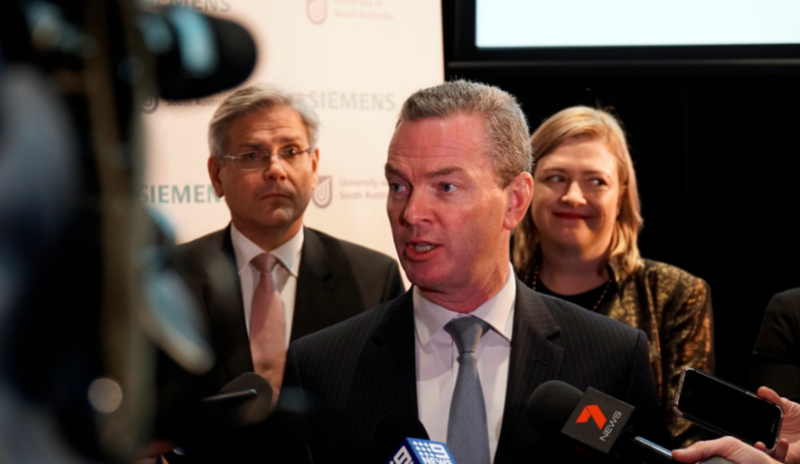 Premier Steven Marshall, Defence Minister Christopher Pyne and Professor David Lloyd, vice chancellor and president of the University of South Australia, attended the announcement. "I’m delighted to be here today announcing the grant of Siemens’ PLM advanced industrial software with in-kind commercial value of more than $450 million to the University of South Australia. It demonstrates the great partnership we have with the state of South Australia, which began in 1872, and our commitment to partnering with great educational institutions to building the workforce of the future," Connolly said. "I can’t think of a better place to be making this announcement. The University of South Australia’s MOD is Australia's leading future-focused museum, provoking new ideas at the intersection of science, art and innovation – a perfect place for such an announcement." The grant is part of Siemens’ commitment of over $1 billion in advanced PLM software grants to select universities nationally and will enable students and the university to develop the skills needed to successfully participate in Industry 4.0. Minister Pyne said this $450 million grant will provide young South Australians with training in some of the most advanced shipbuilding design and production software in the world. "Ensuring young Australians are trained and ready to take up roles in the shipyards that will build the Future Frigates, the Future Submarines and the Offshore Patrol Vessels is a vital task," Minister Pyne said. "This new venture between Siemens and UniSA will help in creating the workforce base we will need here in South Australia to make the most of the Turnbull government’s record $90 billion investment in shipbuilding." Premier of South Australia Steven Marshall welcomed the partnership between Siemens and the University of South Australia, and said the venture is an ideal way to engage young students in advanced technologies and upskilling them for jobs of the future. "This investment in shipbuilding technology will act as a catalyst for South Australian skills development in advanced manufacturing, as well as having broader applications, in particular for our growing space sector," Premier Marshall said. "The defence and space industries will create future jobs for young South Australians, and it’s exciting that students will now have access to state-of-the-art software and when they finish study there will be jobs for them here in their home state." Professor Lloyd said the partnership with engineering giant Siemens Australia will provide extraordinary opportunities for UniSA students and for local industry in the state. "It’s exciting to think that our students will soon have access to the same software used to design and develop everything from Space X, the Mars Curiosity Rover, Maserati Ghibli and other world-leading innovations such as the digital shipyard for Newport News (US) where aircraft carriers are built," Professor Lloyd said. "Not only will it allow us to give our students experience of an Industry 4.0 environment, it will also deliver huge benefits for manufacturing research at UniSA and for the industry partners we work with every day to support innovation and enterprise. Across space, mining, environment, defence and biomedical technology – it will allow us to model and prototype new ideas and give our students experience of advanced technology in the production of things, systems and processes."